This tip provided by BV Pillai from SDN details how to call a MDM Java-API executable application from ABAP using the provided MDM TECH 5.5 add-on or workarounds. 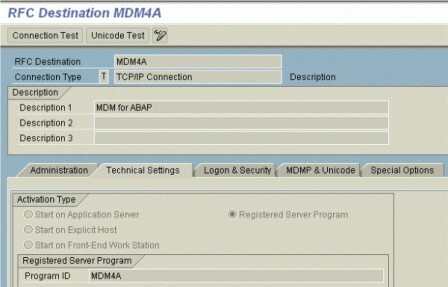 SAP has provided the MDM API for ABAP as a part of the 'MDM TECH 5.5' add-on, you can try another workaround way of connecting to MDM through the method described in the blog. 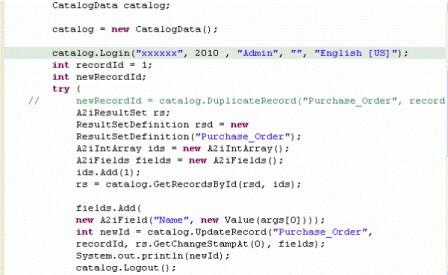 The prerequisite for this scenario is you need to have a MDM Java application, which can run as a console application. Using the 'rfcexec' you can register the executable in the ABAP system by registering with a TCP/IP RFC destination (program-id). You can create a simple MDM Java application that can connect to the MDM repository and accept command line arguments to update field value of a table in repository. 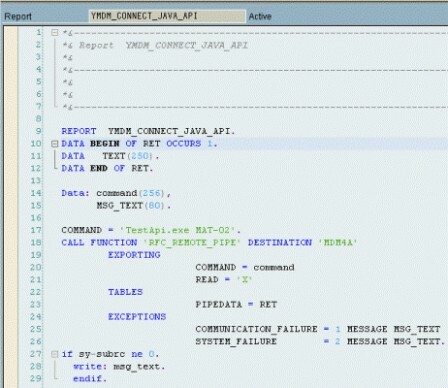 After creating the application, compile and test your application using NetWeaver Developer Studio. Make an executable (.EXE) out of the .jar file from NWDS using any Java utilities. You will notice that the value for the name filed has been changed from "MAT00000004" to "MAT-02". Using this scenario, you can do mass updates of records by passing the business values from your SAP R/3 system. Want to read more from this author? Click here to read BV Pillai's weblog. Click here to read more about Master Data Management (MDM) on SDN.